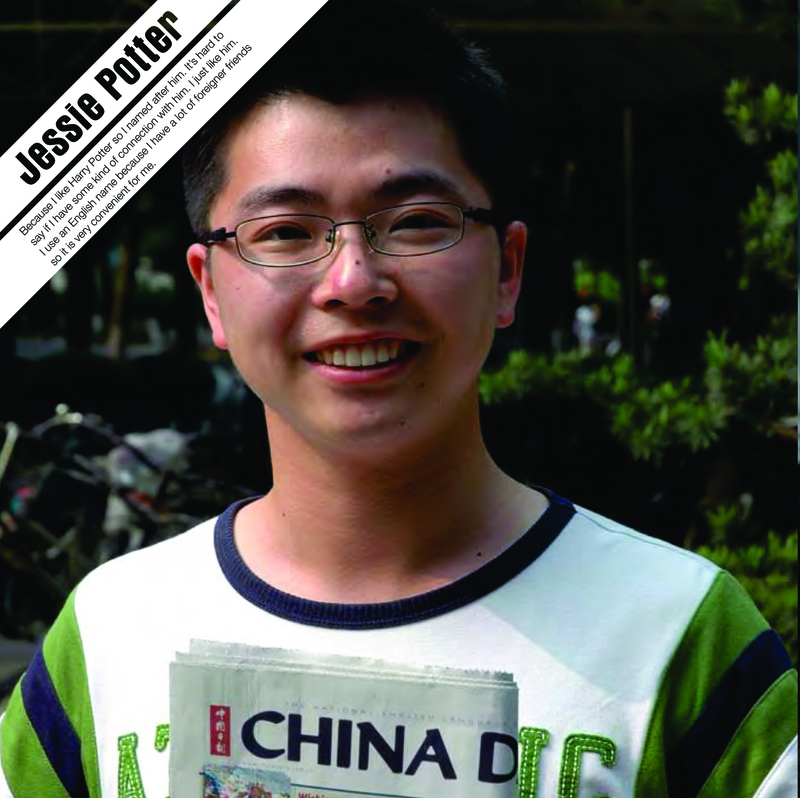 ‘In China, My Name Is…’ Book Contest: Win A Copy! The English names of Chinese people in China. You have them in all sorts, from the common to the extraordinary. Candy, Jessie Potter, Apple, Cindy, Mint, Shining, Jack and Morning…just to name a few we came across. We lived in Shanghai for a couple of years and became curious about the background of these names. Why are Chinese adopting English names and how do they choose them? Our curiosity resulted in the book “In China, My name is…”. More than thirty years ago, it was unimaginable in China to express your identity let stand have an English name. Everybody had the same identity; wearing the same MAO suit was one way to show that. The opening up policy has already had a great impact on society and culture, and our book “In China, My name is…” shows just that. We asked a simple question: “Do you have an English name?” But behind this question lay many answers and insights ranging from China’s past to its future. This fascinated us, so we decided to hit the streets to see whether our analysis was right. We did our research in Shanghai. We spoke with Chinese from different provinces and “social layers”; poor street workers, visitors off the Millionaire fair, religious monks, students and so on. Shanghai is a melting pot, attracting people from all over China. This gave us the chance to provide a broad perspective on this subject. What were our main insights? 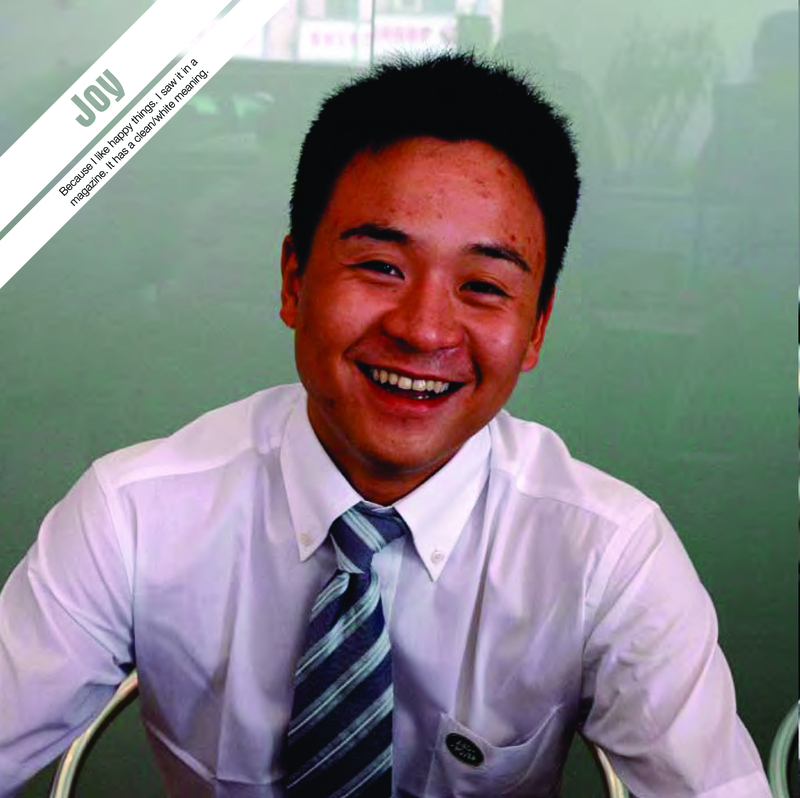 Chinese adopt an English name for: easier communication, showing off social status and to secure the personal destiny. Because of the fast developments in the country, more and more Chinese have contact with foreigners. Here is where cultural differences really play a role. As Chinese is very difficult to pronounce for foreigners, a word in Chinese can have a different meaning when it is pronounced incorrectly. “Horse” becomes “marijuana” or “to ask something” becomes “kissing” for example. Maybe hilarious for foreigners but for locals this can be embarrassing. Name giving is really important in China; it has a connection with your destiny according to the Chinese. Your destiny has to have a positive outcome, right? So it better be pronounced correctly! During our research we often spoke to a Bill or Billy wanting to become as famous and successful as Bill Clinton or Bill Gates. We also saw that Chinese choose an English name to show off their status. To have an English name shows you probably went to university, have contact with foreigners or work at a prestigious foreign company. For some people, the English name was just a way to communicate in an easier way so the meaning of the name had no high importance, as long as it sounds good and is easy to remember. For others, the meaning of the name was as important as their Chinese counterpart, making the way they choose it and its meaning more significant, fitting character and often future ambitions. Interested to see how these young generations in the big developing cities are expressing their identities? 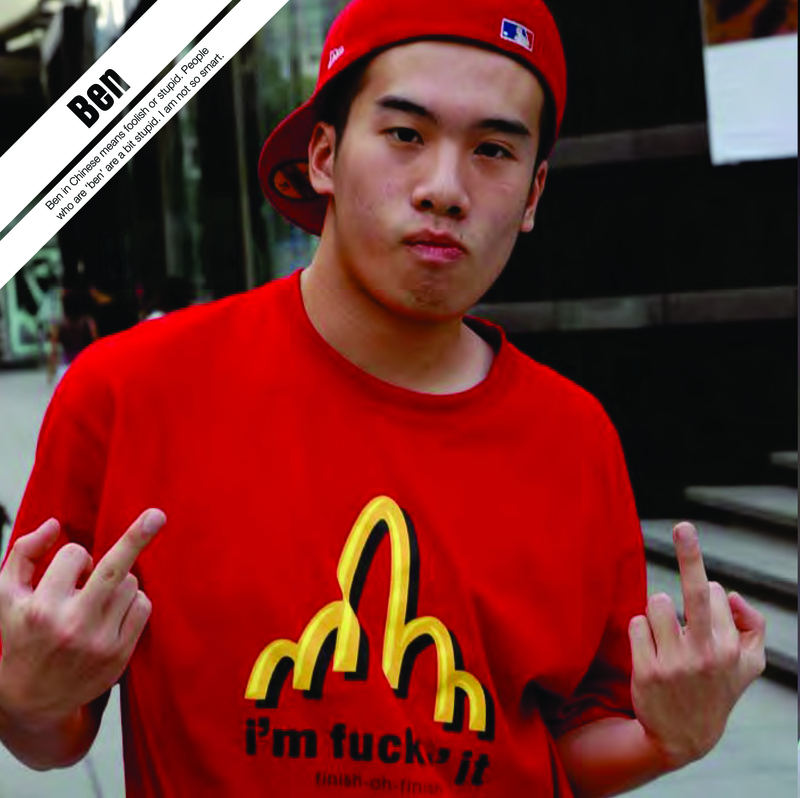 We’ve included seven of the over 200 Chinese people featured in our book, with their explanations of their English names: Anita, Apple, Ben, Charlie, Jessie Potter, Joy, and Merry. To see more, look for our book online , in a local bookstore, or visit our website, chinese-identity.com, for more information. Want to win a free copy of our book? We’re giving away three copies! Are you Chinese and have an English name? What is your English name? Why did you choose it and how? Are you a foreigner and have a Chinese name? What is your Chinese name? How did you come up with your Chinese name? Or, have you seen or heard of any other interesting English names for Chinese people in China and how they chose them? You may submit multiple entries. Each entry must be of a different story. Contest submissions must be posted by the end of Sunday 2009 December 20. The three stories chosen by Valerie and Ellen to win a free copy of “In China, My Name Is…” will be announced on Monday 2009 December 21 Tuesday 2009 December 22. You must input your real email address in your contest submission. It will not be published but it is needed to contact you if you are a winner to arrange shipping the book to you. Shipping of the contest prize books will be handled by Valerie and Ellen, and their publisher Mark Batty Publisher. All unclaimed books will be fed to an alpaca. No story to share? Won’t win? Just want to buy the book? Purchase the “In China, My name is…” directly in many local bookstores (ex. Garden Books in Shanghai and Beijing), online via Amazon , or through our book’s official website. 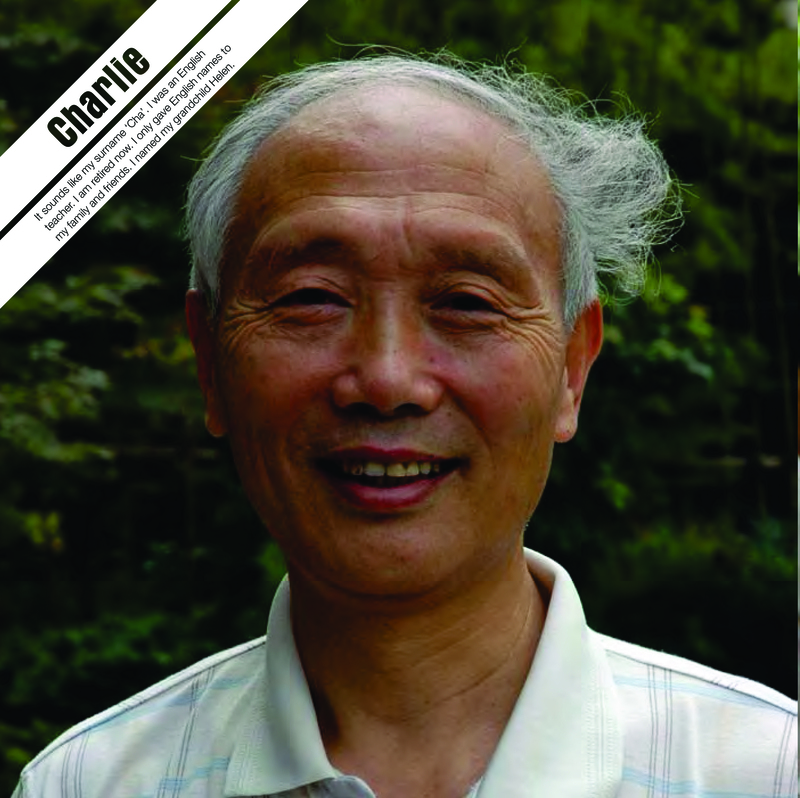 “In China, My name is…” is a 176-page hardcover book that includes over 200 Chinese people and their English names along with full-color high-quality photos. Ask Valerie and Ellen A Question! Since we (that’s us above) will be reading everyone’s stories and choosing winners, we’ll also be here to answer any questions you may have about our book, ourselves, and our experiences in China and with Chinese people. Just tell us what you think or want to know in the comments below and we’ll do our best to respond! Authors Valerie Blanco and Ellen Feberwee met each other during their study 'Concept & Brands' in the Netherlands. From day one they began working together. Both craving culture shocks they moved to a country where they expected the biggest cultural differences; China. Study, work and travel were the main activities throughout their stay. Currently they live in the Netherlands again. "Culture and society inspire us. We would like to share our findings and hope this will enrich people's life and business. If only in a small way." Pingback:Mark Batty Publisher : » “In China, My Name Is…” and ChinaSMACK.com e-event/contest starts today!